visited the Dancing Pencils stand. 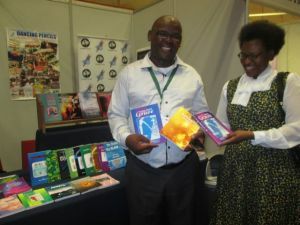 He is shown in the picture with Hlengiwe Ngcongo, Assistant Manager, Language Department, of Arts and Culture. Philani was an offender in Westivlle Men’s Maximum Security prison in 2013 when Felicity spent six months grooming the men in right brain writing. Not only did Philani have a short story in the anthology “Stories from the Grave” and a poem in the anthology “Tears of the Inmates” (both launched at Exclusive Books, Pavilion, Westville in October last year) but he has gone on to write his first novel, Awkward Journey to Triumph. Philani is holding these three books which were on display at the umSinsi/Dancing Pencils stand.